Hello! It's Kara and I'm back with a card featuring some of the products from the most recent release. The release included some really beautiful nature inspired sets along with some versatile basics. 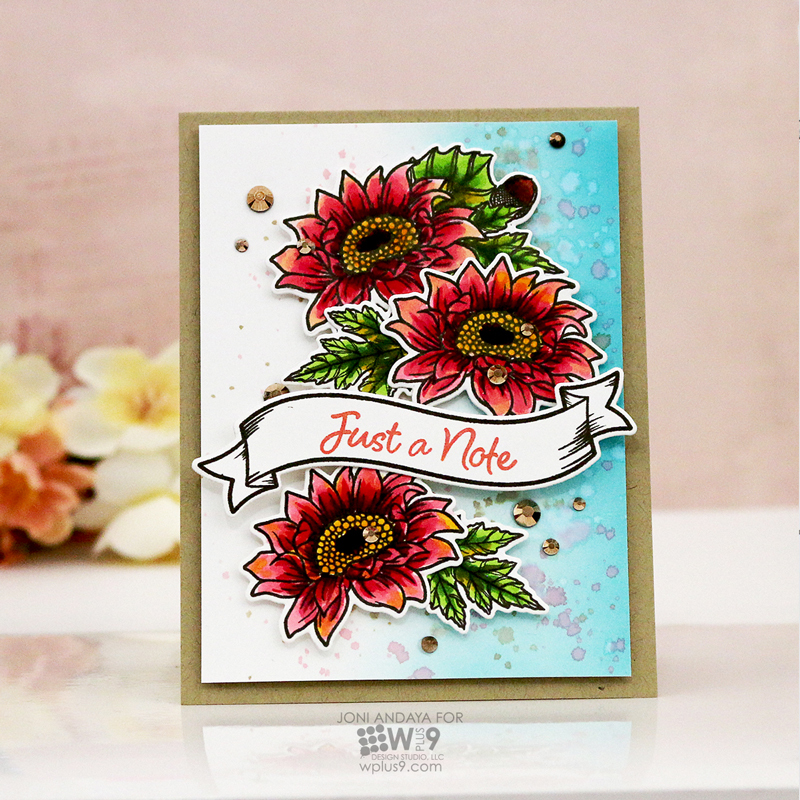 My card today shares just one of the many ways you can use the awesome Clear Cut Stackers: Hexagon Die! I chose the two smallest hexagons in the set and lined them, up one inside the other. I used a bit of post-it tape to hold the two dies perfectly in place. I then die cut several pieces of white cardstock. When I was done I was left with hexagon frames and centers. 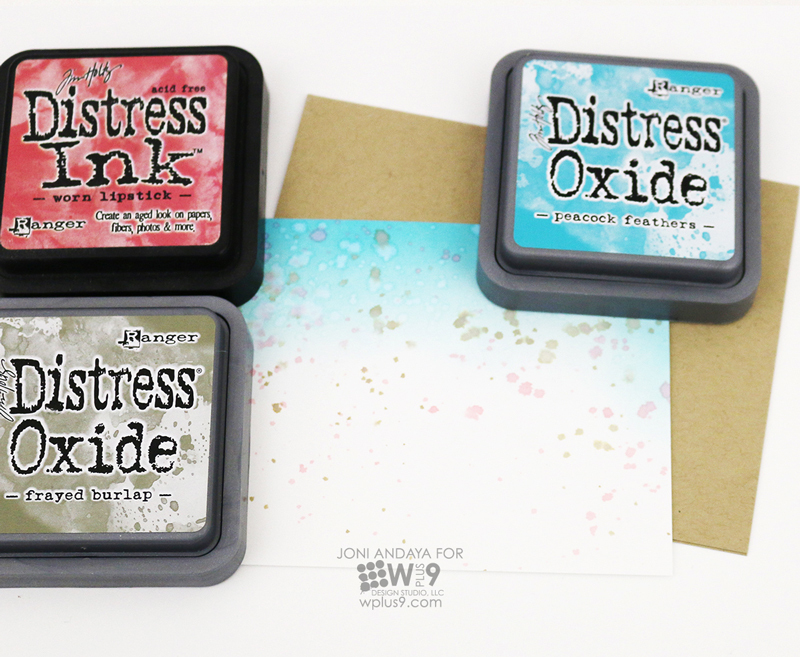 I added color to the frames and centers using sponge daubers and Pure Color Dye Ink in the shades Little Piggy, VI Pink, Sweet Gelato and Cranberry Crush. I adhered the hexagons to a piece of white cardstock that had been cut with the 4 Bar Stitched Rectangle Die. 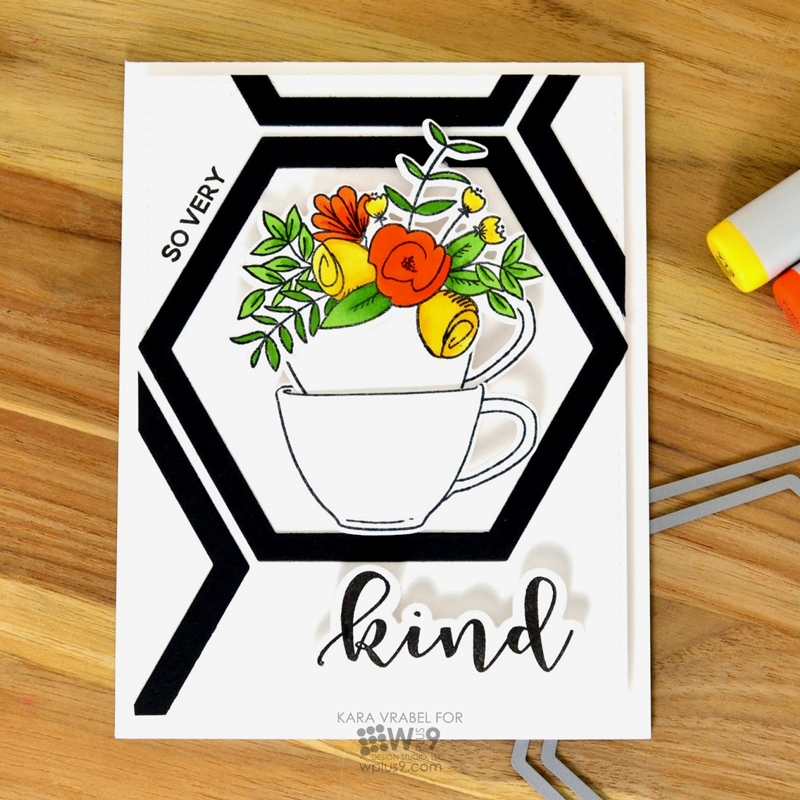 I popped up a sentiment from the new So Very stamp set and stamped the secondary sentiment, from the same set, inside one of the hexagons. I love how the position of the hexagons gives the illusion of a white frame around some of the small hexagons. Thanks so much for stopping by today! Happy Satur-yay to you! It’s Janette Kausen here, guesting with you today. I am enamored with Wplus9 and am thrilled to be able to share with you, once again! I am a die-hard summer fan, but I must admit there is just something about a cool breeze flowing through my home and snuggling into cozy sweatshirts. Let me have it autumn! The anticipation of the turning weather inspired this fall themed card. 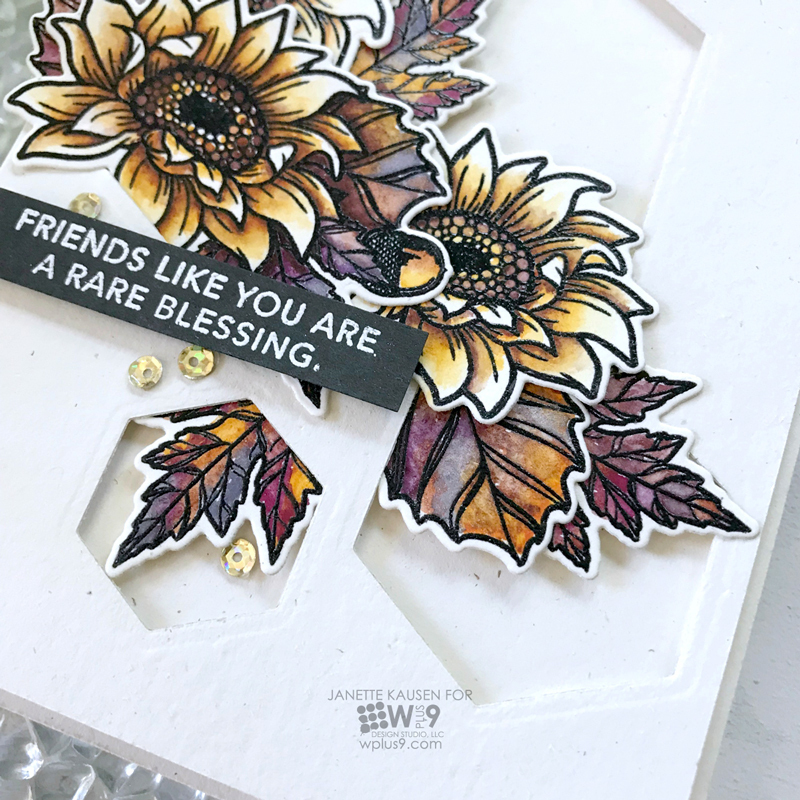 The project I am sharing with you today features the newly released Wplus9 Autumn Blessings, its companion die cuts, and Clear Cut Stackers: Hexagons. I’ve used Daniel Smith Watercolors in Transparent Red Oxide, Aussie Red Gold, Quinacridone Purple, Quinacridone Violet, Perylene Violet and Sugilite Genuine, the colors of a rich fall. After stamping the images in Pure Color Black Dye Ink, I clear heat embossed them. I then watercolored the flowers adding the pigment to the base of each petal where the shadows would realistically be the darkest and blended out with clear water. The leaves are painted with all six colors on my palette. Sometimes I wet the leaf first, other times I did not. The variation provides interest and detail to the overall finished project. 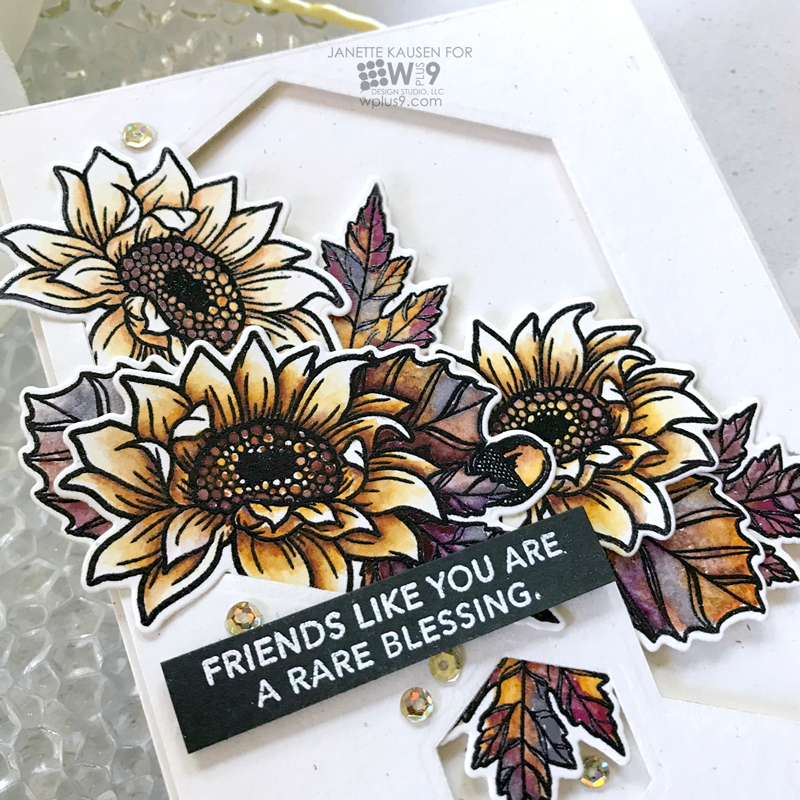 Once the images were dry I die cut them with the Autumn Blessings companion dies and tucked them into an Oatmeal cardstock panel that had been die cut with Clear Cut Stackers: Hexagons. 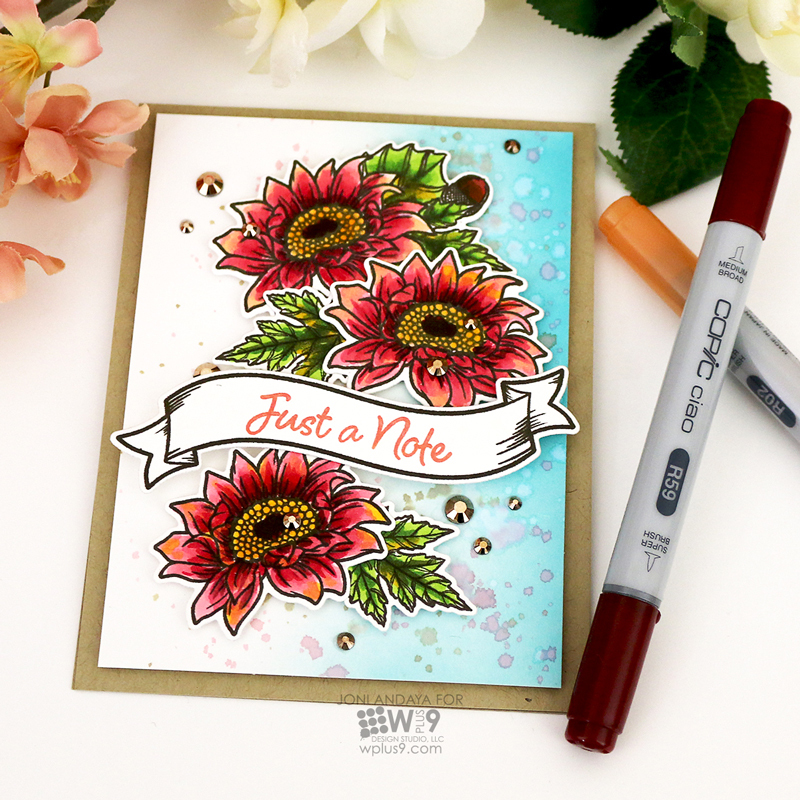 The tutorial shows tips for die cutting delicate cardstock and keeping all die cuts secure when the need to turn the panel to the back arises. 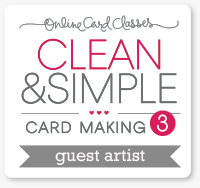 Add foam tape to back of panel, adhere to an Oatmeal mat, and then to a folded card base. Finish card by adding a white embossed sentiment on black and adhering gold sparkly sequins. Thank you for joining me today, and, thank you to the Wplus9 family for inviting me to another adventure into creativity! I hope you’ve been inspired and I’ll see you again! 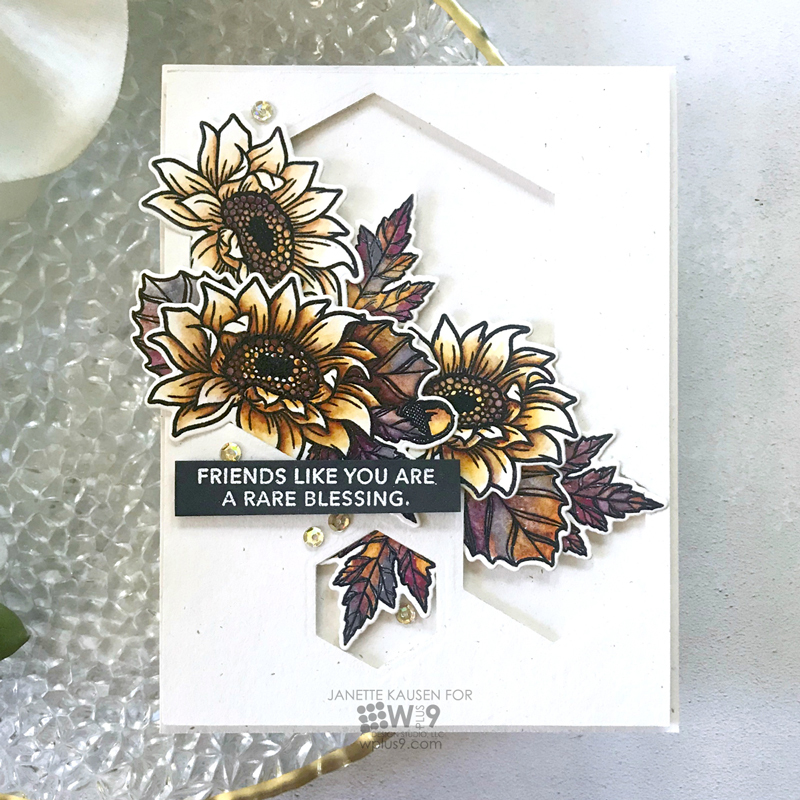 Hello Everyone, Joni here sharing my take on this gorgeous flower set from Wplus9 X Stephanie Low Creative - Autumn Blessings. Autumn tends to get overshadowed by Christmas in the card making world. Don't you think? The Autumn window seems to last a week or two and then it's on to Christmas for what seems like months! But, the autumnal color palettes are so stunning! It's such a shame not to take advantage. And the sunflowers in this set scream "cover me" in all of those beautiful colors! I know we typically see sunflowers depicted in yellow. But did you know that they actually bloom in gorgeous shades of yellows and golds, oranges, reds and rusts, and even some corals? To begin my card I first stamped the images on a white cardstock with a Versafine Onxy Black Ink. To color the images, I used Copic Markers and then die-cut each image with it's corresponding die. Next, I distressed my background using Distress Oxide Ink in Peacock Feather and then splattered the background using Distress Ink in Worn Lipstick and Frayed Burlap. To finish this card I added some Jewels from Pretty Pink Posh. Here's another look of the finished card. I hoped you enjoyed! And I hope this inspires you to do some Autumn inspired crafting! The thing I really love about flowers is that they can be used year round. Simply swapping out your color palette can transform a bouquet to be appropriate for any season. Especially when it comes to the more whimsical illustration style - because they are recognizable as flowers, but not any particular type. 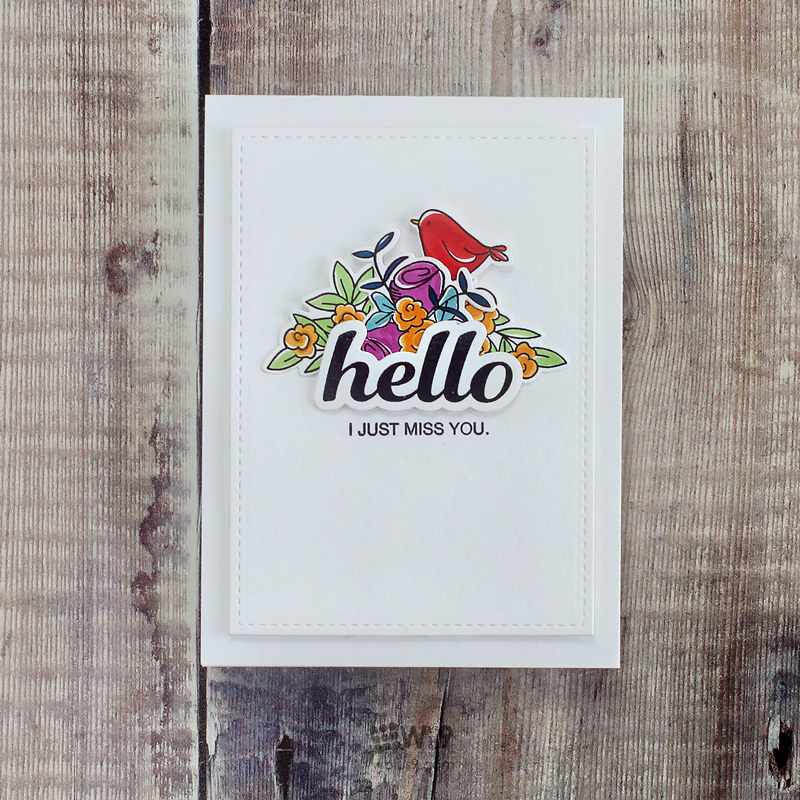 Our new Hello & Thanks stamps and dies are the perfect all occasion set. I send out more "Hello" or "Just Because" cards than any other kind. I think it's always nice to receive a card when you least expect it...for no particular reason. 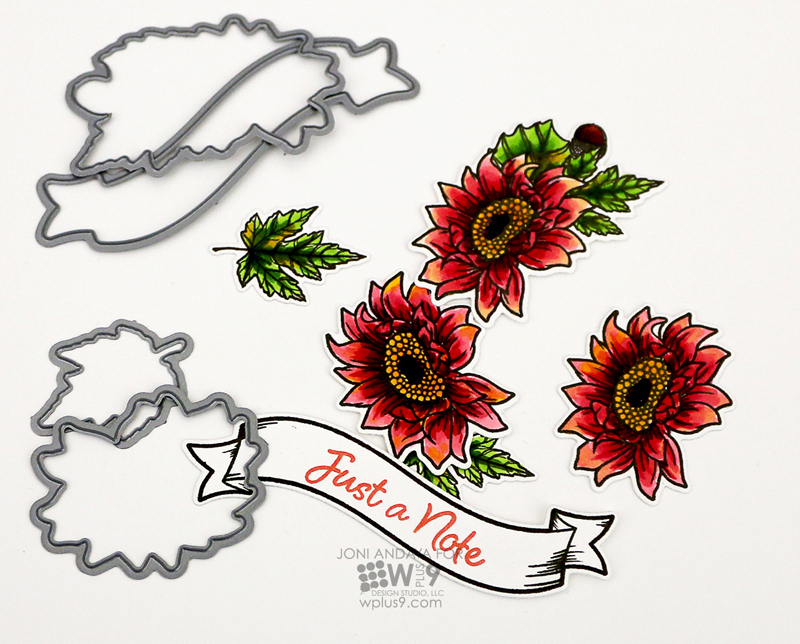 The little bouquets in this set are perfect for whipping together quick and easy cards that look like they took way more time than they actually did. For this little duo, I stamped out several of the images in the set using Memento Tuxedo Black ink. Then used Copics to color in the images. Again, I went super simple with my coloring to push these images a little more towards the modern side. I just used one Copic for each color and laid in a simple flat wash. I left white breaks in some areas to separate some of the areas and add a little more interest. Those white breaks act as a highlight without any additional work or color blending. I die cut everything using the companion dies and then adhered to a panel die cut with our Stitched Rectangles Die. The bold sentiments included in the set are the perfect contrast to the thinner more delicate illustrations. You know what they say...opposites attract! I hope you enjoyed today's post and this look at Hello & Thanks as much as I enjoyed illustrating it! As always, thanks for stopping by! Hello everyone! I'm sure you have been enjoying this new release. 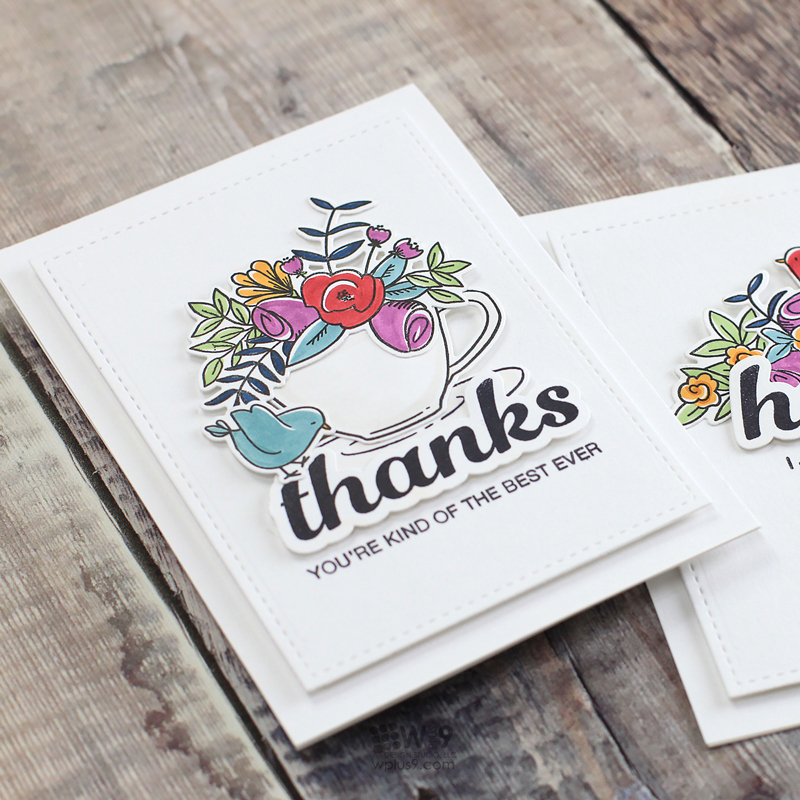 There are so many wonderful new stamp and die designs. I have been sharing many projects on my blog, but I am excited to share a project with you here and I saved one of my favorites! Have you ever seen hexagon shelves? I love them! I wanted to recreate the look of those shelves on my card using the new Clear Cut Stackers Hexagons. I used two dies nested together to create a frame. I adhered one full hexagon in the center as my focal point and several partial hexagons to give the illusion of more shelves. Then, I needed to decorate my shelf. 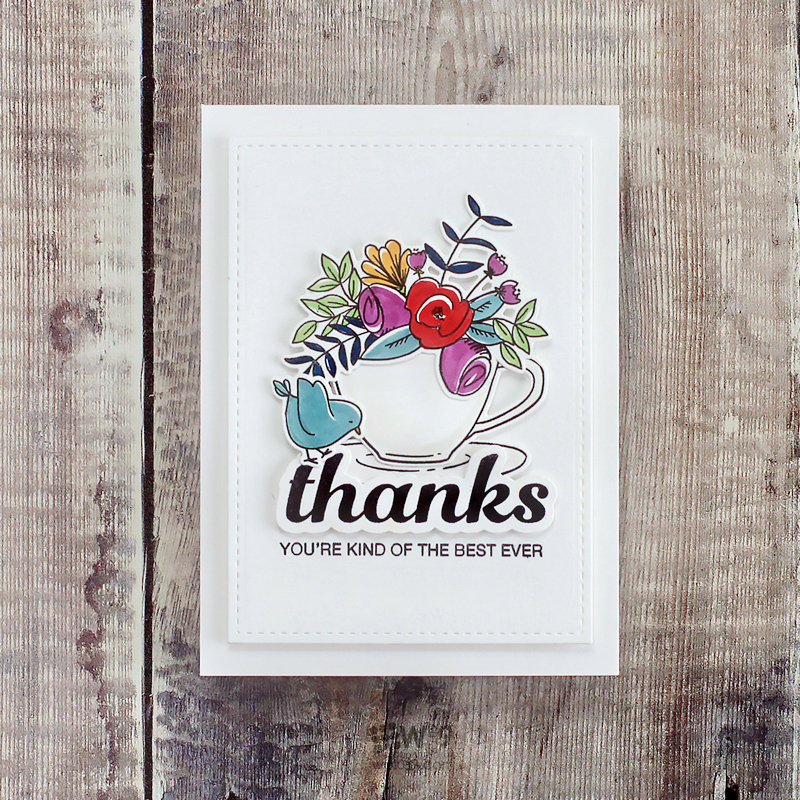 I used the Thanks & Hello set to create a stack of teacups. I simply cut along the rim of the bottom cup so that I could place the other inside. 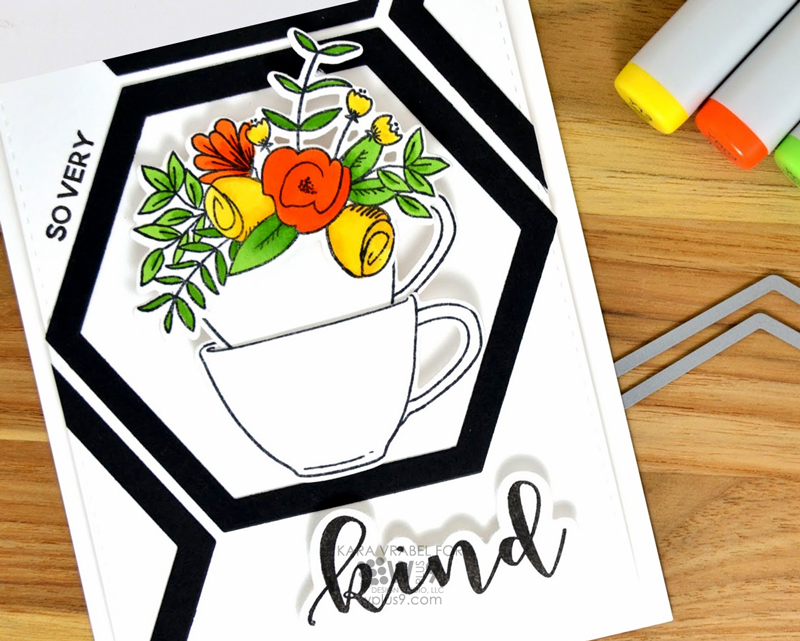 I colored a bright floral cluster to place inside the top cup using my Copic markers. 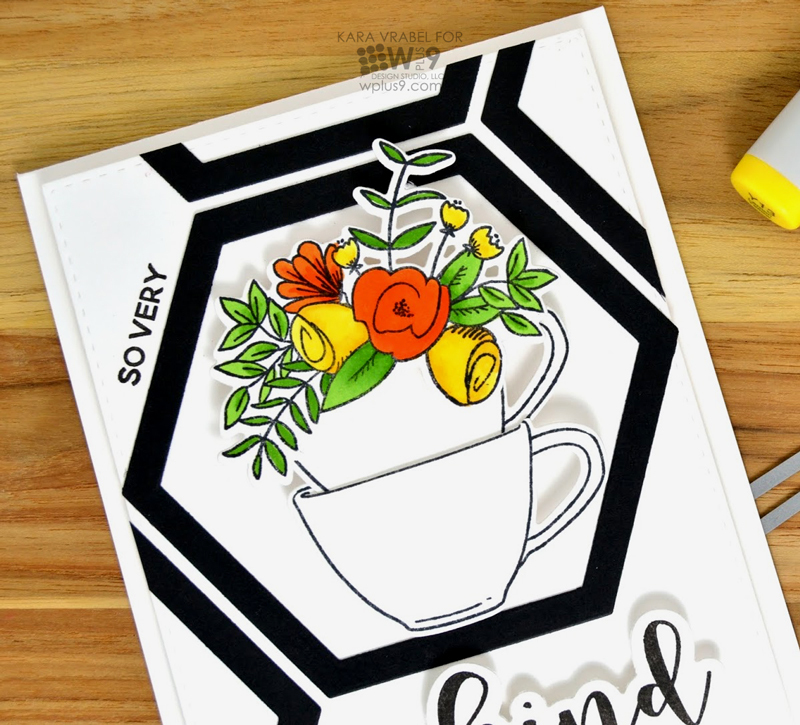 Using the new So Very stamp and die set, I added the "So Very Kind" sentiment. I love the versatility of the Hello & Thanks set. With the floral and teacup images you could create something with a very vintage feel or a modern look like I have done here. I wish this was on my wall!